The Japanese Yen (JPY) is the official currency of Japan. 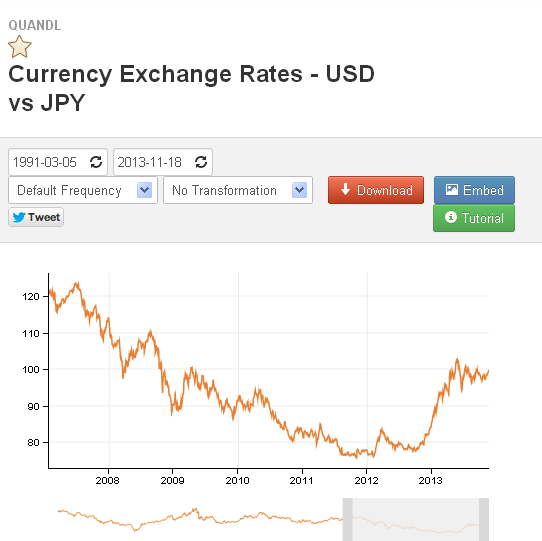 From Quandl you can download free USD / JPY historical data back until 5 March 1991. Step3: Choose a format for downloading USD / JPY data from the next window. Hint: ".csv" and . "xls" formats are OK in most cases. You can open ".xls" files with MS Excel, Libre Office, etc. Most statistical or technical analysis tools need ".csv" files etc. Press "Download Data" to download data to your computer. Number of downloads per day is limited to 50 if you are not a registered user of Quandl.com. So if you see an error message related to this when downloading USD / JPY historical data, you should either register or wait another day.